What the Pho! - Eat. Sleep. Vegan. I think that’s what all of us here in Toronto were saying* when it was announced today that Mayor Rob Ford and his team would be raising fares on our local transit, the TTC. Add that to some of the other recent announcements from city hall, and the fact that it’s -15C outside today, and well, it’s not been a great January here in Toronto. To make today just that little bit nicer, I decided to make some vegan pho. For those not familiar with pho, it’s a traditional Vietnamese noodle soup, usually made with chicken or beef broth as the base. Hearty, warming, spicy and delicious, just what we needed on a bit of a dreary Monday. For my vegan soup base, I used this great recipe from Emily at The Kitchn as my inspiration, but made a few changes to include some miso in the broth and make use of the spices I had available to me. I also simmered the broth for longer to allow the flavours to develop. 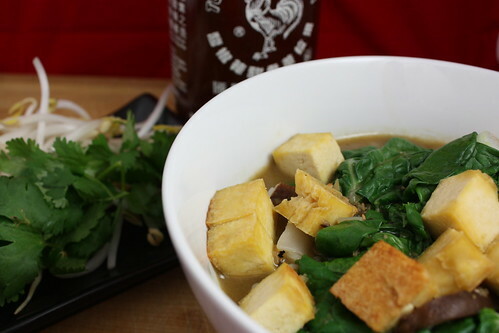 When it was time to eat, I loaded up my bowl with baked tofu cubes, bok choy, bahn pho noodles and thinly sliced shiitake mushrooms, then garnished with bean sprouts, cilantro and sriracha. 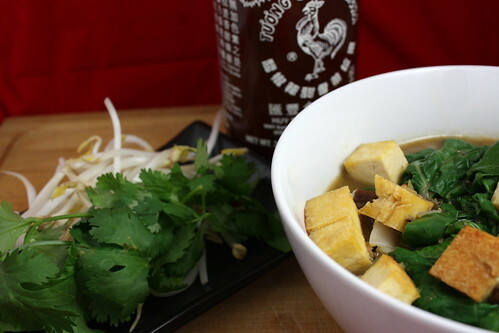 Perhaps not a traditional pho, but it certainly works as a vegan version! The only problem with this recipe is it only makes two bowls. You might want to double it if you want leftovers, or if you’re really hungry after a day of complaining about politics. To make the broth: put the chopped onion and ginger in a small pan and cook them under the broiler until they are browned but not burnt, 5-10 minutes. While they brown (keep an eye on them, the broiler can turn things from brown to black in about 2.2 seconds flat! ), place the cinnamon, anise, cloves and coriander in a large pot and place on the stove over medium heat, stirring every so often to prevent burning. Once your spices are nice and aromatic and your onion and ginger are ready to go, put the rest of the broth ingredients into the pot with the onion and ginger. Let come up to a gentle simmer, then cover and let cook for 1 hour. Strain the broth, making sure to reserve the liquid and get rid of the carrots and other vegetable bits. I know usually we do the opposite in the kitchen, so I figured a reminder might be appreciated! Yes, I’ve nearly lost broth on more than one occasion because I was on auto-pilot, how did you guess? When the broth is nearly finished cooking, you can prepare your noodles according to package directions. You want them to be a bit chewy – don’t overcook them to the falling apart stage. To assemble: Place half the noodles into a bowl, and top with half the tofu, bok choy and mushrooms. Cover with half the broth. Make a second bowl exactly like the first. Let each person add in their preferred amounts of cilantro, bean sprouts and any other toppings you like. *For those not catching what I mean, pho is pronounced like ‘fuh’ not ‘foe’. Ahem.